Who made US the judge of the American-style IPA? You might be asking yourself this question, as we asked ourselves when we set out for the first-ever blind tasting to see who we at Eat Drink Boulder would pick as Best of Boulder County IPA 2015. ‘How do we judge so many great beers?’…’I’m giving everyone such high scores!’…’I’m giving everyone low scores!’…’I have no idea what I’m doing’…These are some of the candid thoughts of our nine brave tasters from Eat Drink Boulder who decided to tackle who is the best at brewing one of the most popular and fastest growing American craft beer styles – the American IPA. Ah, get to it who’s the winner? We – the tasters – are clearly the winner here. We’re talking about some of the greatest beers in the country. Here in Boulder County, brewers are competing with the best of the best to brew some of the cleanest, most well-rounded and pronounced hoppy brews. It isn’t fair, but when we set out to declare the “Best” we have to finish what we started, so here it goes. 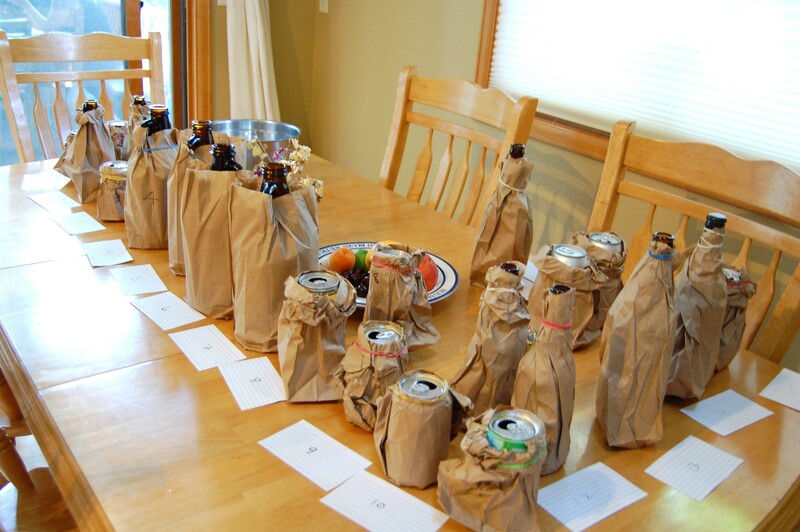 Bags were labeled with only a number, we went over scoring guidelines and the sipping began. It is worth mentioning that we tasted in glass cups and rinsed with water after each sample – about 1 ounce – was tasted. We at Eat Drink Boulder want to urge you to drink responsibly. During our blind tasting, we also munched on some delicious grub every so graciously donated by The Post Brewing Co. and FATE Brewing. We thank you very much for your generosity. 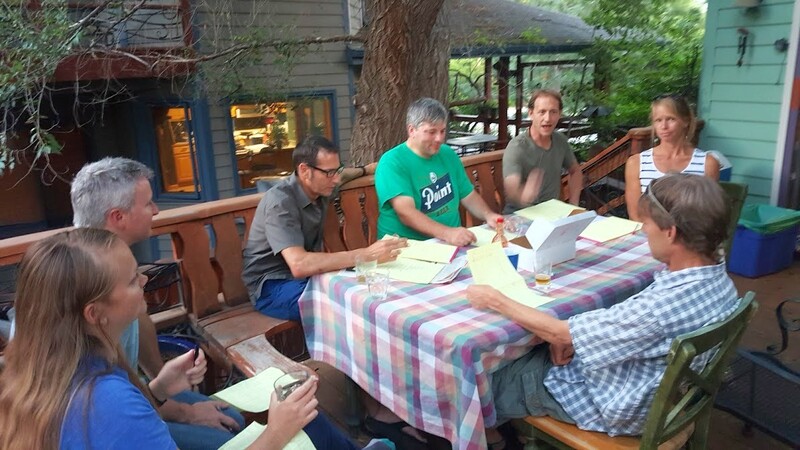 Best of Boulder County IPA 2015 blind tasting. Samples were lined up and covered with paper bags to keep it as blind as possible. Finally we calculated the Tasters’ Averages: In order to keep things consistent, we threw out the highest and lowest scores to determine our tasters’ average. This accounts for any flukes – too high or too low score – that can have a huge impact on average score. We kept the values into consideration and posted them as the “High v. Low” score in order to show the wide difference in opinions among tasters. High v. Low “Value” is the difference between the highest and lowest scores; the higher the value, the more polarizing the beer was perceived by our tasters. Also included are my own notes, for a personal touch. THE RESULTS: Listed highest to lowest scores as determined by the EatDrinkBoulder.com judges. Description: The unique Amarillo hop creates a big, grapefruit-like citrus flavor and aroma, making Mojo a very zesty IPA that’s crisp and refreshing. Description: *ß=SS Grossen Bart: German for “BIG BEARD”. This IPA is as full as it gets. Very hoppy, yet smooth as silk. This makes us all very hoppy, hoppy, hoppy. You may just feel inclined to mow your teeth afterwards! Description: Music: AC/DC, Scorpions, Great White, and Leslie’s hot tub party mix. Insane Rush IPA is the relatively new brewery’s flagship brew. Awards: Silver at 2015 Denver International Beer Competition. Silver at 2014 U.S. Beer Open Championship Silver at 2013 Colorado State Fair Beer Competition. Description: Citrus forward hops make this totally drinkable Moirai IPA our #1 seller both on draft in our brew pub and to local restaurants and bars. Rachel’s notes: Tasted a bit like alcohol on first taste, slight bitterness. Mellowed out for second taste. Description: India Pale Ale using a very unique combination of hops in stunning proportions. Rachel’s notes: Good aroma; earthy, hoppy but not too overpowering. Description: Golden Mosaic is a dry-hopped session IPA with Mosaic and Citra hops. “We decided to call it Summer’s Ale just to differentiate it from the saturated IPA crowd,” said John Frazee, founder. Rachel’s notes: Slight saltiness, medium hop flavor, ginger maybe? Overall Like. Description: Upslope India Pale Ale has a complex malty character and is more well-balanced than most IPAs, but still offers that bitterness that IPA lovers seek. Complex malty character meets the bitter side. Rachel’s notes: Mild hop flavor, smooth on the nose, drinkable and mild. Description: In the 1700s one crafty brewer discovered that a healthy dose of hops and an increased alcohol content preserved his ales during the long voyage to India (as depicted in our label) to quench the thirst of British troops. Today, we tip our hat to that historic innovation by brewing Colorado’s hoppiest pale ale. Avery IPA demands to be poured into your favorite glass to truly appreciate the citrusy, floral bouquet and the rich, malty finish. Rachel’s notes: Crisp and hoppy flavor; light mouthfeel. Description: Sanitas IPA is a definitive Colorado IPA. Gold in color with a harmony of ripe pineapple & dank, grassy hop undertones followed by a bold bitterness. A medley of organic malts provide a delicate sweetness and medium body. Description: By sending the hot wort through a bed of organic whole cone hops in our “hop back,” the Green Bullet wields complex hop flavor and aroma without cringing bitterness. Organic barley malts give a caramel, earthy deepness to the beer. At the same time, our dry-hopped fermentation process brings forth the bold tanginess of quality organic American hops. Description: American IPA is moderately hopped with tropical fruit and tangerine flavors. Dry hopped with Chinook hops. Description: Momentum IPA is a fruity, floral session IPA with Colorado Crystal Hops for aroma. Rachel’s notes: Surprising amount of carbonation, this is sort of like a hoppy champagne, which we kind of like. This brewery, formerly The Kettle and Stone Brewing Co., changed its name to Vindication Brewing last May. One of its founders, Eric Huber, is a 2011 GABF Silver Award Winner with years of brewing experience at the Mountain Sun Brewery in Boulder and Oskar Blues in Lyons. Rachel’s notes: Intensely bitter. For some people, that’s a good thing. Description: Summer TEAth is a 4% ABV summer IPA brewed with American 2-row barley malt, red wheat malt and light crystal malt and fermented with our house ale yeast. It’s well hopped in the kettle and in the fermenter with a blend of two dwarf hop varieties called Azacca and Pekko which offer intense tropical, citrus and herbal aromas. This is complimented by a kettle addition of Sunny Green Tea from Boulder’s Pekoe Sip House. This is a tea blend that features dried papaya and pineapple whose aromas shine through along with the hops while the tea delivers an herbal flavor and gently astringent mouthfeel which evokes the sensation of sipping on iced tea. It’s dry, light bodied and utterly refreshing. Rachel’s notes: This was our most controversial beer because of the addition of green tea. I personally enjoy this beer because I love green tea. Others were thrown off by the green tea flavor after saturating their palates with traditional hoppy IPAs, which resulted in a negative opinion of the beer. *Descriptions, for the most part, were copied verbatim from the brewery’s website. ***Some noteworthy results were that 5 out of 9 tasters voted Boulder Beer – Mojo IPA in their top 3 beers. This was understandable to some and a surprise to others. Could it be that Colorado’s first microbrewery still makes the best IPA around? Well, duh. With so many innovators and novelties in the market these days, it’s understandable finding the best takes us to the place where it all began. Another noteworthy finding was that one third of tasters chose Sanitas Brewing’s Sanitas IPA in their top 3 beers. It is interesting because when the averages were calculated, Sanitas fell to #9 – it just shows how scoring and judging is not the end all to beer judging. Some of the beers were disqualified after the tasting because they aren’t American IPAs. It was a blind tasting so we didn’t know what was what until the end. Next year we promise to compare apples to apples. We apologize to the breweries who, for no fault of their own, were disqualified. Oskar Blues Brewery – Dale’s Pale Ale, Longmont: At the time of the tasting, one of our tasters brought in Dale’s Pale Ale, which is classified as an American Pale Ale. Since the tasting, however, Oskar Blues has released a traditional American IPA called “IPA” – check your local market for cans available across America. IPA has not yet been rated by Beer Advocate. ***A note on Session IPAs: We had three entries that were session IPAs, meaning they have a lower ABV of 4-6%. We took what breweries had at the time, some of them only had sessions available. We decided to keep them in the running as long as they qualified as a traditional American-style IPA. The entries include Gravity Brewing Summer Ale, Vindication Momentum IPA and The Post Brewing Co. Summer TEAth Summer IPA. If you disagree with our decision, feel free to let us know! What is YOUR favorite Boulder County IPA? Let us know in the comments below.